If you would like something super trendy to try these super long layers. 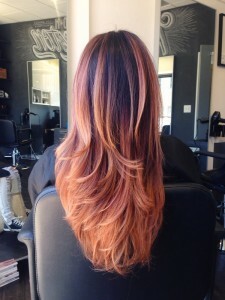 Long hair with a lot of layers is ideal for showing off dimensional color. Root base results in a dark brunette shade that can help to really make the strawberry blonde balayage highlights look a lot more vibrant. This rich color contrast’s best shown off when hair is worn in curled or braided styles.